A Conservative councillor has come under fire for a Twitter comment in which he compared the huge turnout at Jeremy Corbyn’s rallies with Nazi gatherings under Hitler. Cllr Chris Steward, a former City of York Council leader, has been criticised, with a call for him to apologise, after he wrote the comment about popular rallies held by the Labour leader. 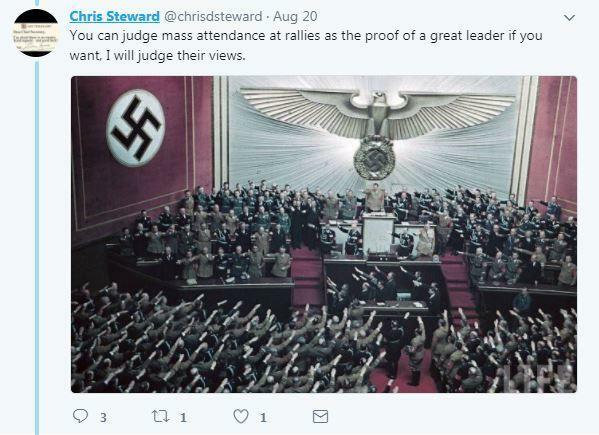 “You can judge mass attendance at rallies as the proof of a great leader if you want, I will judge their views,” he tweeted, alongside an image of a Nazi gathering. Have there been rallies this summer? Nothing in the MSM about them if so. Quel surprise.